When Chaney* decided on Richard Daley Community College as the perfect place to start her career, she felt the payoff that came as a result of all her hard work as a high school student at Chicago’s prestigious Change Charter School. As a proud member of the first graduating class of the college preparatory high school on the Southwest Side, Chaney had high hopes to go to college and start her path toward an accomplished career after graduation. “I got my goals set and I’ve always wanted to get a career, be someone in life, make my parents proud,” Chaney said. Schools like Change, a charter school in the overarching Chicago Public Schools system, are known for high student academic success due to its strong support system and high expectations for students. For Chaney, the rigorous curriculum was just one challenge she encountered during her time at Change. As a Deferred Action for Childhood Arrivals (DACA) recipient, Chaney knew the road ahead to being accepted to college was one filled obstacles. Administrators at Change are proud of their students’ accomplishments, which have earned the school a 1+ level from the School Quality Rating Policy (SQRP) that Chicago Public Schools use to evaluate their schools. Schools are evaluated through a variety of indicator that differ based on whether the school is an elementary, middle or high school. Change stands in the 90th percentile because of its 1+ rating, the highest score a school can achieve. Several factors have played important roles in the school’s success. Administrators point to strong performance on standardized tests and high graduation and college enrollment rates as strong influencers in the rating. Chaney played a role in her school’s graduation rate in 2014, but according to the school’s high-level staff, she was never accounted for in the college enrollment numbers. Chaney doesn’t have a social security number because she is undocumented, and regardless of her DACA status, her enrollment was never entered into the system. All data on CPS students come from the National Clearinghouse Student Tracker system, which houses data for schools across the nation on the number of students who graduate, enroll in college, and maintain enrollment, among other things. But Change’s administrators said that a snag in the system leads to undocumented students not being accounted for in college enrollment because of their citizenship status, even though the school’s graduation numbers go into the system. “Only 66 percent of students from our school are [currently] publicly enrolled in college—but the numbers are actually wrong because they don’t track for undocumented students and Dreamers,” said Emily Erin*, the school’s director of post-secondary success. This poses a substantial problem for schools like Change, which educate a significant number of undocumented students. “Students in the Southwest Side of the city show up with a lower college enrollment number,” she said. The Southwest Side of Chicago is known for having a high number of immigrant families. 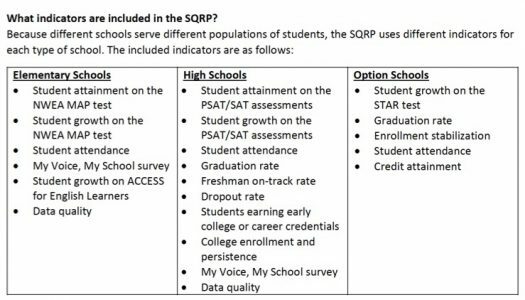 While Change is a charter school, all CPS schools in the area are potentially affected by the SQRP ratings if undocumented students’ data are not accurately represented. According to Erin, this disparity in SQRP ratings poses two significant problems for schools in CPS. The first problem is that a school—charter, public, magnet, it doesn’t matter—receives a rating that communicates to the surrounding communities how well it is doing in terms of academic performance and success. The more students who graduate from a school and enroll in a collegial institution and maintain enrollment, another rating through SQRP, the more attractive a school becomes in the eyes of the community where the school resides, and of the city as a whole. Schools that have high ratings send a message to parents and families that their institutions will provide the most high-quality education, and they have the numbers to prove that claim. With the competitive nature in which charter schools operate, every percentage point counts. Each student who graduates and attends a school, whether it’s a community college or four-year university, earns the charter network bonus points. This particularly disadvantages schools that call neighborhoods with a high immigrant population home, as a huge number of their students could be undocumented and therefore their enrollment doesn’t show in the system. “Students and families are clustered into communities in the city, and it [SQRP] disproportionally affects certain families in certain communities. These families are being disadvantaged the most,” said John Green*, who is the director of math and science instruction at Catalyst. Green believes that another issue with the SQRPs is the spreading of an anti-immigrant sentiment that contrasts with the message Mayor Rahm Emanuel has been communicating about the city. However, Green believes the SQRP scores are antithetical to Emanuel’s statements regarding Chicago as a sanctuary city that will always welcome its undocumented families and children. “I believe that our city is trying to send the opposite message as a sanctuary city. The mayor says we are in support of undocumented students, but the policies that go into our schools don’t reflect that information. It creates an environment of hypocrisy,” Green said. “It reinforces messages that we as a society are sending. Students and families feel invisible and undeserving and uncared for at a systemic level,” he said. Although difficult and hard to keep track of, there is a way CPS can include undocumented and DACA students in the overall college enrollment rates. But, according to Green and Erin, it’s a time drain, because CPS staff have to enter student information into the system manually. Green also said there sheer logistics result in errors because the system caters to so many schools and students. “Sometimes in these systems, it’s so large that nobody had malintent, but it’s possible that it’s overlooked until someone brings it to attention,” he said. While those from Change are working passionately to solve the glitch in SQRP data, other schools say they haven’t noticed differences in what their rating indicate and what the true numbers are. “Citizenship status is not data that is collected or shared so it isn’t reflected in our SQRP data either way,” said Noelle Gaffney, communications coordinator at Acero Schools. Acero is another charter network in the city that has a high population of students who could be undocumented. Green, along with other administrators of charter schools in the city, are working with CPS officials to resolve a complicated and outdated method of recording student academic success. CPS officials did not return multiple requests for comment on the SQRP system and whether or not it disadvantages undocumented students and their respective schools. *Names have been changed to protect the privacy of those involved in the story.